We're taking a look at the best guns and weapons you can find while scavenging around the map in Apex Legends! Our Apex Legends Best Guns post features a full tier list and all of the top weaponry you can find in the game! We're taking a look at the overall effectiveness of these weapons, so come see if your favorites have made it to the top of the tiers. We know how difficult it can be to decide what weapon to use when you first start playing, so we've gathered up all the information we could find to rank the guns in Apex Legends. We took into account damage stats, rarity, and what some of top skilled streamers were using on a consistent basis. We hope that this list will help inform your decisions when you enter the battlefield. Do keep in mind that even if a weapon you like is considered a low tier, that doesn't mean you shouldn't continue to use it. The best weapons are usually going to be the ones you are most comfortable with! This attempt to categorize the best weapons is bound to meet with some disagreement. We attempt to take an overall general look at the weaponry in the game and organize them accordingly. If you truly think we missed the mark on some of these weapons, please let us know in the comments and tell us why! In the S-Tier you will find the top of the top in terms of weaponry. These are the best guns in the game, and are most often used when found. The Legendary Mastiff Shotgun packs an absolute wallop in terms of damage. It's a bit on the weird side because it fires on a horizontal line rather than a traditional shotgun spread. The weapon is also hard to find due to its rarity, and will largely be found from Supply Drops or high value loot areas. This is the other Legendary weapon alongside the Mastiff but is a Sniper Rifle. This one packs an absolute wallop if you land a headshot, and in most cases can one shot a player at any health if you hit it to the dome. The Kraber is interesting due to the fact that you can't find ammunition for it currently. It uses a special type of ammo and once you run out of it, you'll have to either find another one or switch weapons. While these are slightly below S-Tier these are still very powerful weapons and should be prioritized in most situations. This is your standard Desert Eagle style of pistol that rewards players with great aim. It actually shoots pretty fast for this type of weapon, and if you are landing headshots you can make short work of an enemy. This weapon also benefits from a Hop-Up like the Peacekeeper does. The Wingman can have the Skullpiercer Rifling attachment which increases damage when landing headshots. It should be noted that the Wingman might not be as good on console as it is on PC. The Wingman is really good at range when you can control the aim as precisely as you can on the PC. It is not as easy to hit long range shot with a controller. This is an extremely fast firing SMG that can do quite a bit of damage if you can handle the recoil. This gun gets a lot better if you can get some quality attachments, particularly ones for the magazine and barrel. This is really good at close range, but can be used at mid-range with attachments. This pairs nicely with either a shotgun or a longer ranged weapon. One of the best easily found weapons for close range combat is the Peacekeeper. This is great overall, but it gets a whole lot better if you are able to pair it with the Precision Choke Hop-Up. With this added to the gun, you can hold down the aim button and it will charge up. Your shot will then have a much tighter spread, which concentrates the damage almost making it like you fired a slug instead of pellets. Even without the the choke, this is one of the top weapons in the game right now and is dominant in CQC. A fast firing assault rifle that actually does quite a bit of damage despite using light ammunition. It is quite accurate and once you get it fully kitted out it fires like a laser beam! This weapon is great at midrange, but also works nicely in close quarters. LMG weapons are usually on the bad side in most games, but in Apex Legends they are among the strongest choices. Not only is this one surprisingly accurate, it also reloads relatively quickly which is a typical downside of the class. The Spitfire can do a lot of damage in a short amount of time, and doesn't require a full attachment kit to be worth using. Apex Legends Best Drop Locations & Loot Spots – Our Look at the Top Landing Spots! Apex Legends Best Loadouts – Top Weapon Pairings in the Game! Moving into the B-Tier there's a lot less to say about some of these weapons. There's nothing inherently wrong with them, there's just nothing currently that makes them standout among the pack. These are all serviceable weapons, and can be used at a high level. This is your no frills assault rifle that packs a punch and is useful in most situations. It fires a bit slow, but it makes up for it with high damage output. Really good midrange weapon (can be used for longer ranges as well) that is in the sniper class, but being a semi-automatic can be used in a variety of different ways. This is a great overall weapon, and pairs well with a close ranged option like the Peacekeeper or R-99. Auto-shotguns in most games are bad, but the EVA-9 is actually quite good in Apex Legends. It hits pretty hard and can be fired quite quickly. Once you get a full kit equipped to it, you will be surprised how good it does! The Devotion is an energy based LMG that can take a bit to get used to, but inevitably ends up being one of the better weapons in the game. Unlike most weapons, this one takes a bit of time to get up to maximum fire-rate speed. You have to hold down the trigger and it winds up, but once it gets going it absolutely tears people up. To really get this gun to top tier you'll need to have a magazine attachment that extends the length of its high rate of fire. The one thing that holds this weapon back is that energy ammo is hard to find, and the gun goes through it very quickly. If you want to take this weapon even further beyond, look for the Turbocharger Hop-Up that reduces the spin up time. This is another semi-auto sniper but it packs more of that high damage you might be used to with this class. The Longbow can also be upgraded a ton due to it having a full five attachment slots available to it. 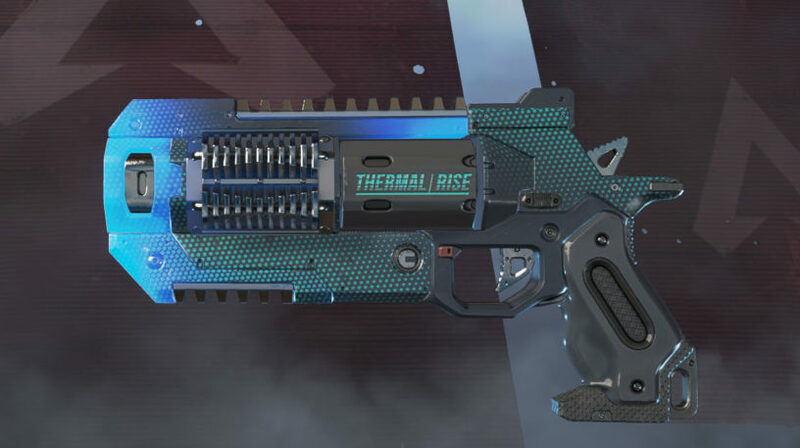 This along with the Wingman benefits from the Skullpiercer Hop-Up that increases headshot damage. Snipers aren't that great in Apex Legends currently, you can't 1-shot with this and enemies will usually just hide and heal if you land a shot. If you like burst weapons then this one is a solid option. The problem for the Prowler is that it requires upgrades to really get the most out of it. If you can upgrade the clip you can get an additional burst out of it, and if you find the Selectfire Receiver Hop-Up you can use it as a normal SMG. As we reach the lower tiers we're talking about weapons that are slightly disadvantaged. These are the weapons you'll want to be shedding once you find any of the above guns. However, these are better than the D-Tier ones, so just be happy you don't have one of those instead! Good if you like burst style of weapons, and can deal quite a bit of damage if you are able to land the full burst on the noggin. You can also switch this to a more standard AR by changing the fire mode. Another of the energy ammo using weapons and maybe one of the most interesting guns in the game. This weapon fires three projectiles for every one shot and fires them on a horizontal line. Not only that, it's a sniper rifle?! This is best used at mid-range because from larger distances the horizontal spread becomes too much and makes it impossible to hit all three projectiles. This gun also gets a lot better with the Precision Choke that can be charged in ADS mode for a tighter spread on your fire. Due to this being a sniper, it doesn't eat through the hard to find Energy Ammo and doesn't suffer the same weakness as the Devotion. A fast firing pistol that just doesn't do enough damage to be viable. It's fine in a pinch, but you'd rather have an SMG or shotgun in this slot. A kind of weird hybrid pistol and SMG that doesn't really work too well as either. It also fires pretty slowly for an SMG and has a short magazine. This is the bottom of the barrel in terms of weaponry. These are just flat out weak compared to all the other guns and should be avoided unless you have no other option available to you. Just your garden variety pistol that doesn't do much damage and has nothing really going on with it. It's serviceable in the very beginning of the game, but should be replaced at your earliest convenience. A pistol and a shotgun mashed together. It does okay damage, but you have to be very close to your enemy to get any use out of it. It's just a bad weapon that contains the disadvantages that shotguns and pistols generally have. Apex Legends Patch That Should Help With PC Crashes is Live! Apex Legends Season 1: Wild Frontier Patch Notes: Fixed Hitboxes, New Legend, More! Apex Legends Battle Pass Has Been Announced: Wild Frontier! Launch Pads Have Shown Up in Apex Legends? !